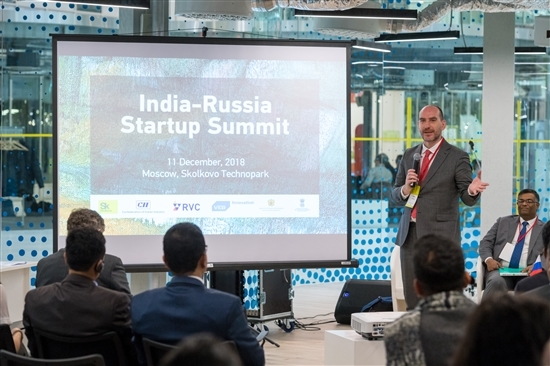 Russian-Indian economic cooperation may be best known for major military hardware deals, but the future lies in the exchange of hi-tech innovations, speakers resolved at the India-Russia Startup Summit held at the Skolkovo Technopark on Tuesday. 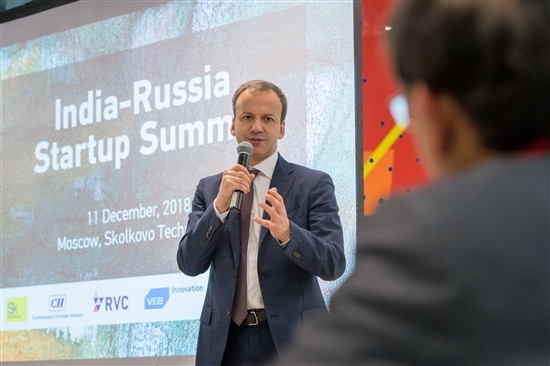 Skolkovo Foundation chairman Arkady Dvorkovich speaking at the India-Russia Startup Summit on Tuesday. Photo: Sk.ru. Both Indian and Russian tech entrepreneurs attended the day-long event, together with representatives of business and development institutes in each country. Economic relations were once dominated first by wheat, tea and textiles, then by defense and nuclear technology, and are now dominated by knowledge industries, speakers noted, but Tuesday’s summit was focused firmly on the future. “We should focus on the new things that are coming to the market: digital solutions, new materials, sensors, IOT, etc.,” said Arkady Dvorkovich, chairman of the Skolkovo Foundation. “In those things, we should have the same standards from the very beginning to work in the same markets together on an [equal] legal footing, rather than having competing standards that will only create barriers for both sides,” he said. 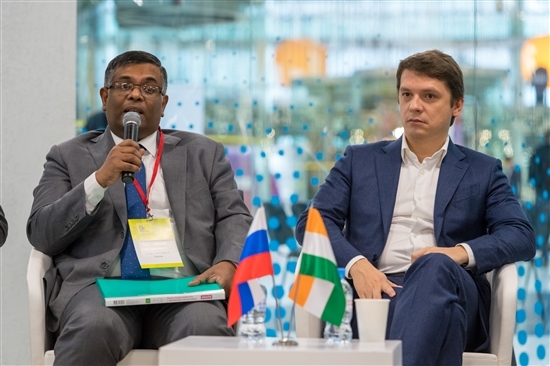 Gangadharan Balasubramanian, deputy head of mission at the Indian embassy in Moscow (left) and Igor Drozdov, chairman of the board of the Skolkovo Foundation. Photo: Sk.ru. In the past, differing tech standards in areas such as health and safety have posed a challenge to Russian-Indian tech transfer, Vladimir Korovkin, head of research in innovations at the Skolkovo School of Management, had already noted. The new strategic economic dialogue between India and Russia’s Economic Development Ministry is based around 5 basic pillars: transportation, innovation, agriculture, the digital economy and other ideas, said Gangadharan Balasubramanian, deputy head of mission at the Indian embassy in Moscow. “Russia has a strong R&D setup; the fundamental research Russia has done has been quite enormous, and there are a lot of things our countries can cooperate on in this particular field,” he told the summit, adding that at 1.3 billion people, the Indian market is huge. 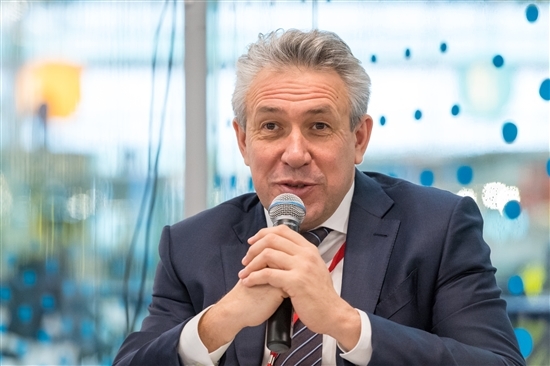 Other areas of cooperation are the traditional areas of transportation infrastructure, aircraft and machine building, as well as new technology such as artificial intelligence, blockchain and biotech, said Sergey Gorkov, Russia’s deputy Minister of Economic Development. “India has excellent experience in biotech, medicine and pharma,” said Gorkov. Sergey Gorkov, Russia’s deputy Minister of Economic Development. Photo: Sk.ru. 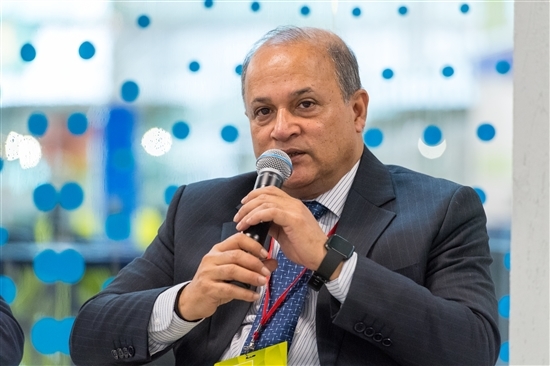 Several Skolkovo startups have already entered the Indian market, mostly working in the space and energy efficiency markets, and the foundation hopes to see more follow suit, said Igor Drozdov, chairman of the board of the Skolkovo Foundation. “I believe that we have huge potential between our countries for our startups to enter Indian markets,” he told the summit. Balasubramanian, the deputy head of mission at the Indian embassy, suggested that one cooperation mechanism could be to set up partner programmes between technoparks in Russia and India. When Indian President Pranab Mukherjee visited Russia in May 2015, he established an India-Russia network of 22 universities in Russia and 20 in India that collaborate on projects, said the deputy ambassador. Noting that Skolkovo has a small but growing network of regional operators, Balasubramanian suggested setting up a similar partner programme between technoparks. Anjan Das, executive director of the Confederation of Indian Industry, suggested a mutual soft landing programme for Indian and Russian startups in each other's countries. Photo: Sk.ru. Anjan Das, executive director of the Confederation of Indian Industry, proposed setting up an Indian-Russian startup platform for collaboration under which Russian startups with potential on the Indian market would be provided with a soft landing programme in India’s incubation systems, and would also get access to Indian investors, and vice versa, with Indian startups gaining access to the Skolkovo ecosystem. The foundation has such soft landing programmes in place, noted Drozdov, encouraging Indian startups to make use of them. Currently, trade between Russia and India is worth $10 billion: significantly less than that between Russia and China or India and China, said Gorkov. By 2025, both sides have set the goal of increasing that figure to $30 billion, said Balasubramanian. Currently, $2 billion of the $10 billion total is accounted for by Indian exports to Russia, while Russian exports to India are worth $8 billion, said the Skolkovo School of Management's Korovkin. The strong political ties between Russia and India don’t always translate into economic ties, said Vladimir Korovkin, head of research in innovations at the Skolkovo School of Management. Photo: Sk.ru. The biggest Indian exports to Russia are pharmaceuticals, tea, textiles and spices, while Russia exports oils, paper and mechanical and electrical machinery to India, he said. By 2025, the countries aim to see $10 billion in Indian exports to Russia, and $20 billion in exports from Russia to India, said Korovkin. The investment goal is 15 billion on each side, expected to be mainly in knowledge industries, reflecting the global digital economy, he said. The Russian and Indian hi-tech ecosystems complement each other, he said, noting that India is the world’s no. 1 country for exporting ICT services, while Russia imports them. There is accordingly plenty of room for cooperation, he said, noting the “amazing political ties” between Russia and India, and their long and stable history. The summit also included pitching sessions for both Indian and Russian startups, as well as two separate workshops for companies from each country on entering the other's markets.